For a millennium, three opposing forces of humanity--the Cybran Nation, the Aeon Illuminate and the United Earth Federation--have fought a bitter and bloody war over conflicting and unwavering systems of belief. There is no room for compromise. No room for mercy. No room for anything but the complete eradication of anyone with opposing belief systems. Labeled the Infinite War, this horrific conflict has shattered a once peaceful galaxy and only served to deepen the hatred and schisms between the three factions. Now, after centuries of struggle, the battle for supremacy has at long last reached a turning point. You are a Supreme Commander, and only you have the power to bring the Infinite War to an end once and for all. 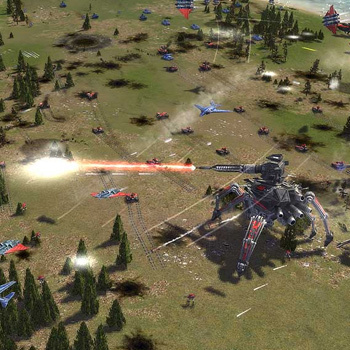 Set in the 37th century, Supreme Commander signals the next evolution in the RTS genre by being the first strategy game to deliver a truly strategic and tactical experience.